texarkana commercial real estate brokerage and master planned land development with texarkana texas. texarkana commercial real estate brokerage and master planned land development with texarkana texas. The commercial real estate brokrage land development in Texarkana is the best with Reynolds Realty Management commercial real estate brokrage and land development. The Broker is submitting the information contained herein in its capacity as an agent and representative of the owner. The information was obtained from services believed reliable; however, Reynolds Realty Management, Inc. makes no guarantees or warranties, express or implied as to the accuracy of the information contained herein. All information submitted is subject to change without notice as regards price, terms, or availability. ©2016 Reynolds Realty Management Incorporated, all rights reserved. 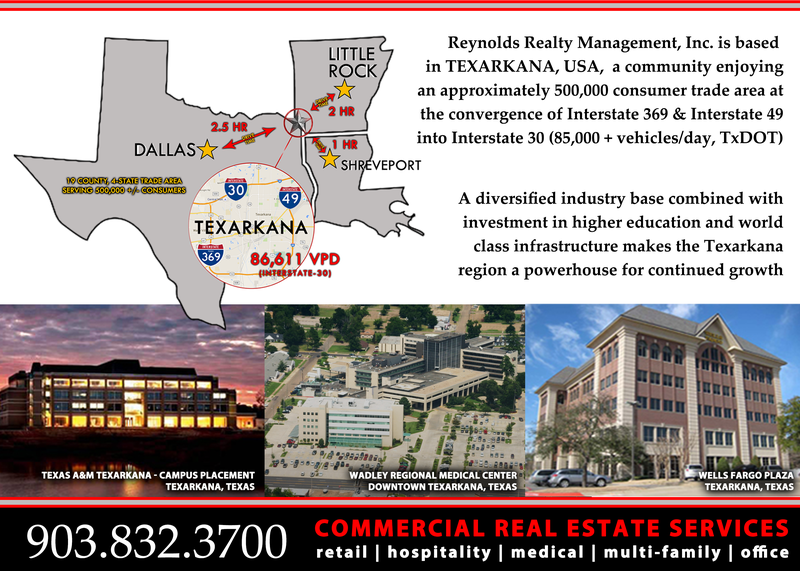 Reynolds Realty Management, Inc. Is a commercial real estate brokerage company based in Texarkana, USA. Reynolds Realty Management is a professional commercial real estate brokerage company with lots of experience in dealing with commercial real estate brokerage.